This treatment is rich in nourishing ingredients, relipidants and repairers. Shea butter and wheat germ oil natural emollient oils and allantoin combine to give the hands very dry and damaged a smooth and plump, a great feeling of comfort and feel infinitely sweet. Result: The skin is immediately re-nourished, softened and soothed. It remains protected throughout the day. Used daily, it prevents the accelerated aging hands. 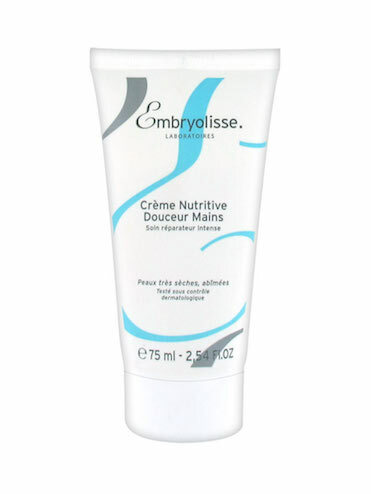 Apply the cream nutritional soft hands, massaging gently. The application must be systematic in the morning and may be renewed as often as necessary during the day. Formula INCI: Aqua, Glycerin, paraffinum liquidum, squalane, glyceryl stearate, Stearic acid, cetyl alcohol, Butyrospermum parkii, Steareth-10, Triticum vulgare, glyceryl polyacrylate, cyclomethicone, dimethiconol, allantoin, 1,2-hexanediol, caprylyl glycol, tropolone , triethanolamine, fragrance. Dermatologist tested. Not tested on animals. Paraben.